Different sizes, available in both white and black. Available in 6',7' or 8' length* in a variety of sizes. 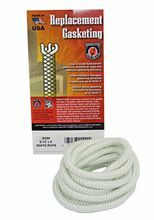 WC1AWK and the WC1ABK is gasket material used on glass in a wood or coal stoves this material is available in a 4 1/2' package. This is available in White and Black. Gasket cement is sold separately for installation. *Gasket kit can vary in length +/- (1) feet.